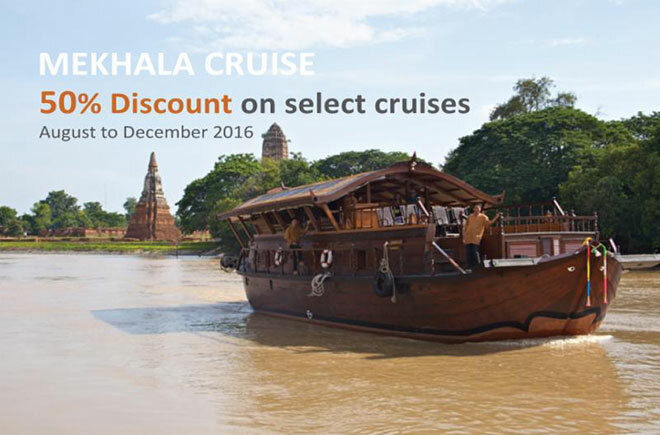 Symbiosis is pleased to be able to offer a generous 50% Discount on select cruises aboard the lovely Mekhala converted rice barge between Bangkok and the ancient capital of Ayutthaya from now until December 2016. The special offer applies to upstream cruise (Bangkok – Ayutthaya) and downstream cruise (Ayutthaya – Bangkok) only. Contact Symbiosis Custom Travel to plan your Thailand holiday now.